Police Department Puducherry has given a new career related name with the name as recruitment by the Police Department, Puducherry. Efficient and well-qualified jobs, Hunter must submit his application for the last date of September 22, 2018 or 431 posts of Police Constable, Radio Technician, Deck Handler, or before that. Applicants who are willing to join this organization, Police Department can apply against Puducherry Jobs and from this page, the Police Department can read the full details of the Pondicherry recruitment 2018, which is completely filled with the entire team of www.telanganaa.in Is structured by. Eligibility Requirement: Those job hunters have done 12th / 10th / ITI (radio / electronic telecommunications) from a recognized university or institute. Candidates should be between 18 to 22 years (post 1), 20 to 27 years (post 2), between 18 to 30 years (post 3) between 22-09-2018. The selection of candidates who are well-fitted in the functioning and responsibilities of the above positions will depend on their performance in the written examination, physical measurement and physical fitness test, during the medical test. The first and most important step is to open the official site, which is http://www.police.puducherry.gov.in. The open date of online submission of the application is: 23-08-2018. Last date for submission of online application: 22-09-2018. Click Police Department Puducherry Recruitment Notification here. 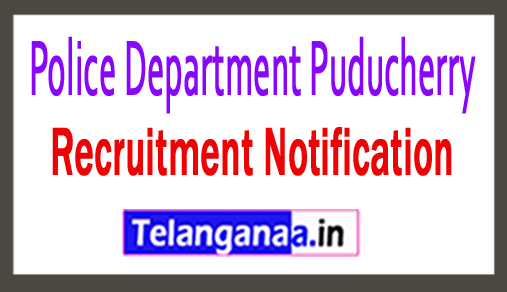 Click Police Department Puducherry Recruitment Notification 2 here.